Following the creation of a Command Centre within the Enforcement Division’s Anti-Smuggling Department in 2012, Serbia Customs has significantly improved its capacity to fight smuggling. This improvement can be attributed to the implementation of a range of tools, including a new web application that provides features and tools to enhance the work of the Anti-Smuggling Department. It all started with a man and a vision. The Head of the Anti-Smuggling Department in Serbian Customs’ Enforcement Division wanted to equip Customs officers working in the Division with the appropriate tools to be able to locate, in one unique location, all the necessary equipment to coordinate the planning, organization and implementation of activities, while at the same time enabling managers to monitor the activities of their staff. Customs Inspector Milomir Jovic developed an application which provides anti-smuggling Customs officers with the possibility to access information, instructions, forms, data, statistical reports, data collection forms, databases and images of scanned vehicles in a fast, simple and secure way from a computer connected to the Serbian Customs Administration’s corporate network (Intranet). The application was launched at the end of 2014 and received immediate positive feedback. 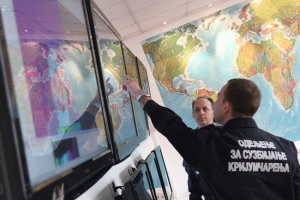 managing operations – the Centre monitors officers of the Anti-Smuggling Department conducting controls, and coordinates the activities of each operational unit within the Customs territory. RIS, the Rivers Information System, used by the Centre to monitor river traffic – the system, which is also installed on vessels used by the Waterways Control Unit, provides information on the current position of vessels, on the vessels themselves, as well as on the presence of stationary objects. In order to facilitate access to these systems and to improve officers’ work station environment, a web application was developed. To access the application, access rights are required, which are customized for each officer according to their responsibilities and role. The application homepage contains a basic menu that guides the user to their section of the Anti-Smuggling Department, and to a gallery of detected violations, as well as to specific databases. Specific restricted sections of the web application contain forms used by the Anti-Smuggling Department – for data collection and reporting for example, information about the protection of officers at work, different guidelines essential for the workplace, relevant news items, and contact details of the managers and officers of the Anti-Smuggling Department. The application enables Command Center officers to assist field officers in analysing the image of a scanned vehicle, regardless of their geographic location. Previously, this was impossible. Officers can access the system of a particular mobile scanner to download the image of a scanned vehicle, or the entire image database of the mobile scanner. The application also allows the database of about 150,000 scanned vehicles to be searched offline according to different criteria, using, for example, the registration number of the vehicle, the state (province/region) in which the vehicle is registered, its origin and destination, the goods, the date of the scan, the assessment, and the title of the image. Managers have access to all web application content, and are thus able to access all information and data collected during Customs controls conducted by anti-smuggling officers. They can prepare automatic activity reports in accordance with pre-defined criteria. For example, a report of the Customs offences detected from 1 to 5 December 2015 (see screenshot 3) can be easily compiled. It would typically include information such as the municipality or the site where a Customs offence was detected, the time of the offence, the name of the officer who led the control operation, etc. Managers can also generate reports on the controls undertaken at border crossings, in warehouses, on vessels, and in private premises at certain periods of time in order to review and assess activities and, ultimately, plan future activities and improve the performance of the Anti-Smuggling Department. Other options include the capacity to visualize the fuel consumption of vehicles used by anti-smuggling officers during a particular period. The implementation of the application was warmly welcomed by the Department’s staff and had a tremendous impact. In particular, the fact that each unit can henceforth showcase interesting cases and communicate details such as the place of detection, and methods of concealment. This has a direct impact on officers who are now able to learn from these cases, boost their knowledge, and, ultimately, improve their capacity to detect offences or other crimes.